Indian Fry Bread and Pico de Gallo! You are here: Home / Recipes / Dinner / Indian Fry Bread and Pico de Gallo! Tamona is back with another great recipe! I love the Superbowl and two of my Superbowl favorites happen to be Indian Fry Bread and Pico de Gallo. My husband loves to have salsa but since he didn’t bring me the ingredients in time, his favorite will have to wait for another time. Growing up my dad use to always tell me how he went to Trader’s Village in Grand Prairie, Texas and ate Indian Fry Bread with my uncles. 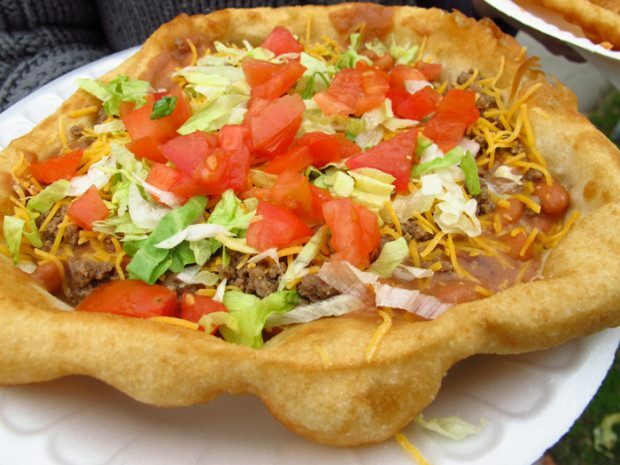 They would walk and shop for hours while they munched on fried dough topped with beans, meat, cheese, lettuce, and tomatoes. It would always make my mouth water. Once I was old enough, I started making my own Indian Fry Bread! This recipe is quick and simple. First, mix flour, salt, and baking powder in a large bowl with a fork. Create a hole in the center of the flour mixture and pour in a portion of the warm water. I do this a little at a time until I have used all of the water. The dough will not be pretty. Flour a cutting board to work the dough. Keep the flour nearby because this is a somewhat sticky dough. Form the dough into a big ball. This ball will NOT be smooth. Tear off small balls of dough and mash them into flat discs. The shapes are not important, just make them as flat as possible. Now its time to start cooking. Heat the cooking oil until its nice and hot. Place them in the skillet one at a time. Cook on each side for about 1 minute per side. Remember the fry bread will brown more after you take it out of the grease. Dress the bread up the way you like. My honey likes his with refried beans, turkey taco meat, spinach, tomatoes, and salsa! What a better way to top your Indian Fry Bread than to add some delicious Pico de Gallo? Sharing the colors of the Mexican flag, pico de gallo is a fresh uncooked answer to homemade salsa. 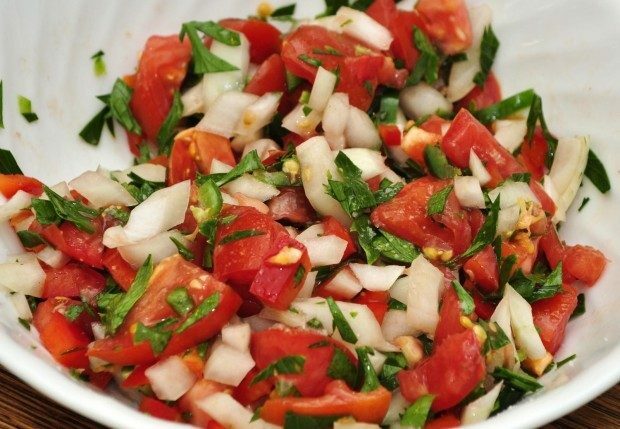 Pico de gallo can be made with a variety of fresh ingredients. Today’s ingredients will stick to tradition and display all the beautiful colors in the Mexican flag. Chop the onion, jalapeno, and cilantro. Wash the chopped veggies and place them in a serving bowl. Dice the tomatoes and place them in the bowl with the onions, jalapenos, and cilantro. Add 2 teaspoons of minced garlic to the mixture. Pour in 1 1/2 teaspoons of lemon or lime juice. Sprinkle lightly with salt and pepper. House seasonings can also be added to reach the taste desired. Chill for 1 hour and serve with your favorite tortilla chips. **Pico de gallo may or may not include peppers. Feel free to not limit yourself to jalapeno peppers. For a pico de gallo with less spice, try banana peppers. If you are bored and have a lot of time, you could always watch me make my Indian Fry Bread.